"Beautiful views! Big sites! Clean Restrooms! " "Nice shady spot with a 5 minute walk to the ocean "
"Great, wooded campground, high elevation, small spots! " "Amazing tent camping spots with incredible views. " "Beautiful views of the night sky and the surrounding area. " "Out of 79 reviews, we're giving Organ Pipe our first 5 Stars! " "Beautiful location high in the mountains, but I'd only stay again if I was in a trailer... the bathrooms are really bad. " "We had a bad experience here from the start.... but if you need a place in the area, it's doable. " "Great little park close to a lot of things in SoCal! " "Can't beat the scenery, but along with birds and animals, you can also hear everything your neighbor does. " "Not easy to get to, but worth it for beach camping and seclusion. " "Beautiful, quiet, well kept park. " "Pretty, well maintained state park. " "As far as we know, the only full hook up campground within Raleigh city limits. " "Nice park for fishing, but the spots are really close together." "A hidden gem of a campground! " "Awesome campground in the middle of the swamp. " "Can't be beat for convenience to Cedar Key, but really, really tight spots. " "Great park on a spring-fed river, plus full hook ups and internet!" "Big spots, lots of trees, close to water, but no sewer or internet"
"Beautiful campground, lots of trees, but no internet or cell service and some road noise." "Great campground just outside Raleigh." "One of the better KOAs we've stayed at -- but what space you get is really important"
"Great park, huge site and close to the boat dock. " "We stayed here because it was close to a local music festival, but wouldn't stay again." "Beautiful, secluded campground on the water. " 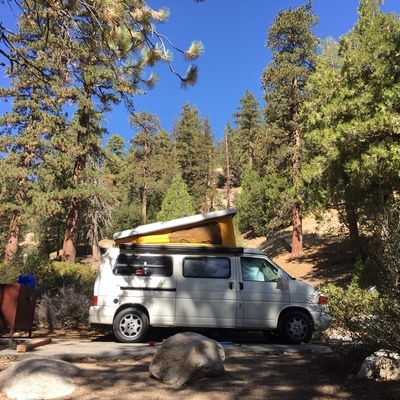 "A welcome full hook up site after days of boondocking. " "Really nice park very close to Seattle. " "Great park with great walking trails and close to the wineries. " "Small park, no hook ups, but in a beautiful location. " Sequim might even be better the second time around. Painted Rock Petroglyph State Park -- truly a gem in the desert! The Most Beautiful Campsite in New Mexico: Rockhound State Park. See what we liked, and disliked, about our first stop in California: Carpinteria State Park. Our Airstream trip stops in Memphis to see Graceland and Sun Studios.